(Nanowerk News) Unexpected voltage increases of up to 25 percent in two barely separated nanowires have been observed at Sandia National Laboratories. Designers of next-generation devices using nanowires to deliver electric currents — including telephones, handheld computers, batteries and certain solar arrays — may need to make allowances for such surprise boosts. "People have been working on nanowires for 20 years," says Sandia lead researcher Mike Lilly. "At first, you study such wires individually or all together, but eventually you want a systematic way of studying the integration of nanowires into nanocircuitry. That's what's happening now. It's important to know how nanowires interact with each other rather than with regular wires." Though the gallium-arsenide nanowire structures used by Lilly's team are fragile, nanowires in general have very practical characteristics — they may crack less than their bigger cousins, they're cheaper to produce and they offer better electronic control. For years, the best available test method required researchers to put a charged piece of material called a gate between two nanowires on a single shelf. The gate, flooded with electrons, acted as a barrier: It maintained the integrity, in effect, of the wires on either side of it by repelling any electrons attempting to escape across it. But the smallest wire separation allowed by the gate was 80 nanometers. Nanowires in future devices will be packed together much more closely, so a much smaller gap was necessary for testing. 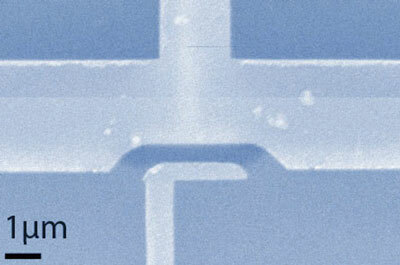 The suitcase-like handle are the two nanowires, one above the other. The darkest areas are gallium arsenide crystal. The two lighter areas in the hape of "plus" signs are gold gates at the top and bottom of the device. The current test design has the brilliance of simplicity. What Lilly and co-workers at McGill University in Montreal envisioned was to put the nanowires one above the other, rather than side by side, by separating them with a few atomic layers of extremely pure, home-grown crystal. This allowed them to test nanowires separated vertically by only 15 nanometers — about the distance next-generation devices are expected to require. And because each wire sits on its own independent platform, each can be independently fed and controlled by electrical inputs varied by the researchers. While applications for technical devices interest Lilly, it's the characteristics of nanowires as a problem in one-dimensional (1-D) basic science that fascinates him. A 1-D wire is not your common, thick-waisted, 3-D household wire, which allows current to move horizontally, vertically, and forward; nor is it your smaller, flattened micron-sized 2-D wires in typical electronic devices that allow electrons to move forward and across but not up and down. In 1-D wires, the electrons can only move in one direction: forward, like prisoners coming to lunch, one behind the other. "In the long run, our test device will allow us to probe how 1-D conductors are different from 2-D and 3-D conductors," Lilly said. "They are expected to be very different, but there are relatively few experimental techniques that have been used to study the 1-D ground state." One reason for the difference is the Coulomb force, responsible for what is termed the Coulomb "drag" effect, regardless of whether the force hastens or retards currents. Operating between wires, the force is inversely proportional to the square of the distance; that is, in ordinary microelectronics, the force is practically unnoticeable, but at nanodistances, the force is large enough that electrons in one wire can "feel" the individual electrons moving in another placed nearby. The drag means that the first wire needs more energy because the Coulomb force creates, in effect, increased resistance. "The amount is very small," said Lilly, "and we can't measure it. What we can measure is the voltage of the other wire." There are no straightforward answers as to why the Coulomb force creates negative or positive drag, but it does. It was named for 18th century scientist Charles August Coulomb. What's known is that "enough electrons get knocked along that they provide positive source at one wire end, negative at the other," Lilly said. A voltage builds up in the opposite direction to keep electrons in place," thus increasing drag. Having an interest on many levels proved useful because making the test device "took us a very long time," he said. "It's not impossible to do in other labs, but Sandia has crystal-growing capabilities, a microfabrication facility and support for fundamental research from DOE's [the Department of Energy's] Office of Basic Energy Sciences (BES). The BES core program is interested in new science and new discoveries, like the work we're doing in trying to understand what is going on when you're working with very small systems." Device fabrication was conducted under a user project at the Center for Integrated Nanotechnologies, a DOE Office of Science national user facility jointly run by Sandia and Los Alamos national laboratories. The device design and measurement were completed under the DOE Office of Science BES/Division of Materials Science and Engineering research program. The work required the crystal-growing expertise of Sandia researcher John Reno, the fabrication and measurement skills of McGill doctoral student Dominique Laroche and elements of previous work by Sandia researcher Jerry Simmons.